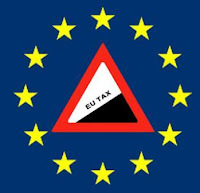 The eurofanatical LibLabCon have been criticising UKIP for voting against an EU Parliament report entitled "Fight against Tax Fraud, Tax Evasion and Tax Havens". They say that it means UKIP is supporting tax evasion. UKIP is absolutely committed to combating tax fraud and evasion but not by giving the EU control over our tax system, harmonising tax rules across the EU and giving EU institutions access to our tax records which is what the report - supported by the Tories, Labour and the Lib Dems - calls for. So the Tories, Labour and the Lib Dems have all voted for the EU to take the place of the British government in discussions on tax fraud and evasion, for direct EU taxation, for the harmonisation of our tax system with the rest of the EU, to share taxpayer data automatically with the rest of the EU and to have the EU take over from the British government in concluding treaties relating to taxation. In fact, the Tories haven't just supported it, David Cameron has led the campaign for the report to approved and wants to take it to the G8. What a mockery this makes of Cameron's pledges to negotiate a new, less intrusive and dictatorial relationship with the EU and surely transferring all these powers to the EU will need a referendum under the impotent and useless EU Act?